How can we keep our trees healthy without pesticides? Bainbridge Island Arborist Olaf Ribeiro has some exciting solutions to offer. April is Arbor Month! 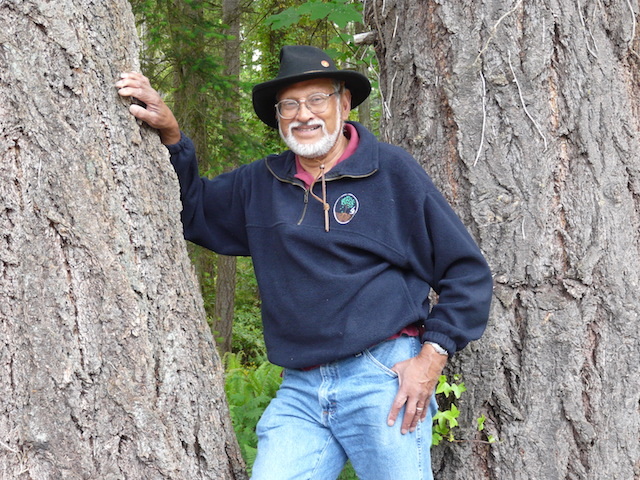 And as part of our monthlong celebration of trees, nationally recognized tree scientist Dr. Olaf Ribeiro will speak at Bainbridge Open Mic Science on Tuesday April 4th at 8:00pm at the Treehouse Café in Lynwood Center. The title of his talk is The Role of Soil Microorganisms in Maintaining Tree Health & Longevity. Since 1985, Ribeiro, a renowned plant pathologist, has been saving historic and ancient trees by improving their health. His research on soil microorganisms has provided greater understanding of the effects they have on plant growth and longevity. In this podcast Olaf tells BCB host Sonia Scaer about his work in isolating soil microbes that has resulted in techniques to treat common infections in pacific northwest trees. He finds that tree health can be maintained without pesticides, by enriching the soil around the trees with a complex mix of microbes that when controlled in special ways can help control soil borne plant pathogens. Listen here as Olaf describes this treatment and some of the challenges involved in getting those microbes extracted for application. The goal is to put the right microbes in the soil to keep the tree healthy for a long time. As a big proponent of planting trees, Olaf believes planting trees is the simplest way to reduce the affects of climate change, since trees absorb carbon dioxide from the atmosphere. He supports those efforts here and abroad, and will be participating in the month long tree celebration throughout Bainbridge Island. Credits: BCB host: Sonia Scaer; BCB audio editor and social media publisher: Diane Walker.